"Want a car that won't break the bank but is still lots of fun? 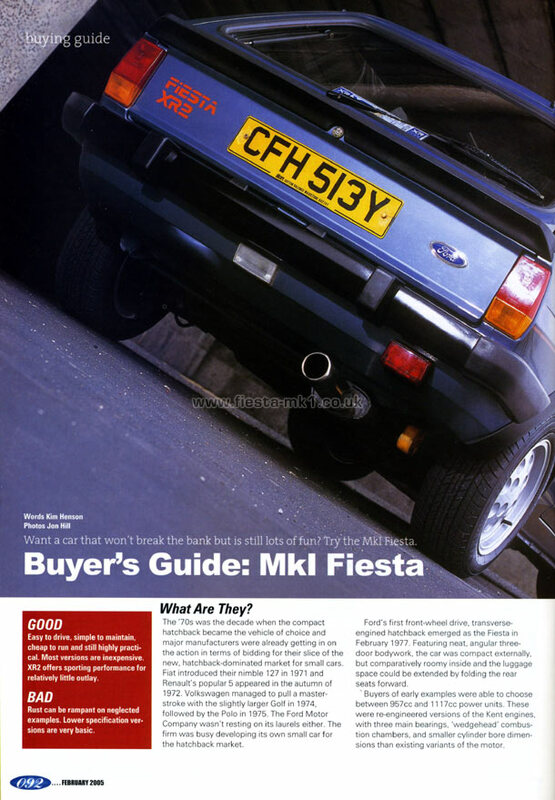 Try the MK1 Fiesta." Buyers Guide: MK1 Fiesta - Want a car that won't break the bank but is still lots of fun? Try the MK1 Fiesta. The 70s was the decade when the compact hatchback became the vehicle of choice and major manufacturers were already getting in on the action in terms of bidding for their slice of the new, hatchback-dominated market for small cars. Fiat introduced their nimble 127 in 1971 and Renault's popular 5 appeared in the autumn of 1972. Volkswagen managed to pull a masterstroke with the slightly larger Golf in 1974, followed by the Polo in 1975. The Ford Motor Company wasn't resting on its laurels either. The firm was busy developing its own small car for the hatchback market. Ford's first front-wheel drive, transverse-engined hatchback emerged as the Fiesta in February 1977. Featuring neat, angular three-door bodywork, the car was compact externally, but comparatively roomy inside and the luggage space could be extended by folding the rear seats forward. Easy to drive, simple to maintain, cheap to run and still highly practical. Most versions are inexpensive. XR2 offers sporting performance for relatively little outlay. Rust can be rampant on neglected examples. Lower specification versions are very basic.